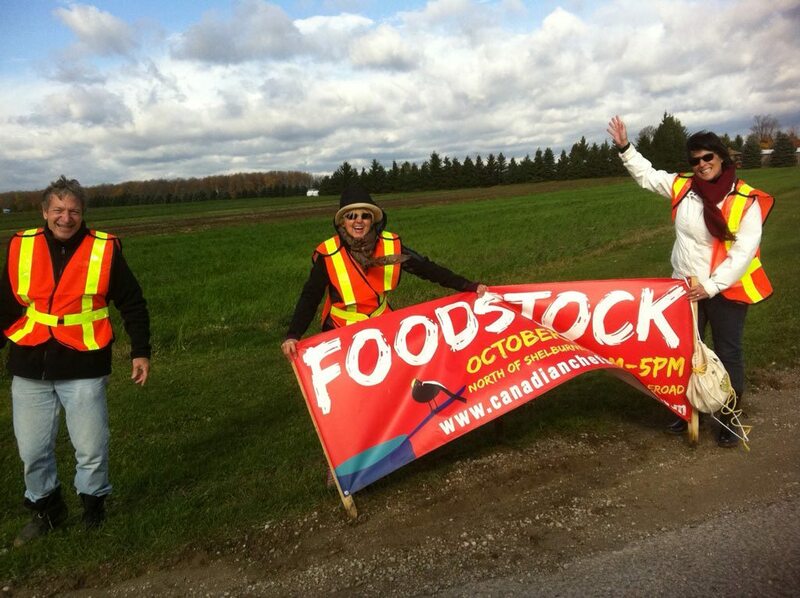 Farmers, chefs, food activists, and food lovers gathered Sunday to celebrate the harvest and raise awareness of a proposed megaquarry in the heart of Ontario farmland. Almost two years ago, we wrote about some potato farmers in Melancthon, a small community about 90 minutes drive northwest of Toronto. They were worried about plans a corporation called the Highland Companies had recently announced, to dig a giant limestone quarry in the middle of the agricultural region, with concerns ranging from effects on the water table to the impact of 700 trucks rolling through each day. Highland had been buying out small-scale local farmers who were informed, they told us, that the company intended to put together a larger, consolidated, potato farming operation. In March, Highland filed paperwork with the Ontario Ministry of Natural Resources seeking permission to dig a quarry on a 2,300-acre parcel of land it had knitted together from this series of smaller purchases. If constructed, it would be the second largest in North America. Given the scale of the project and the depth of the concerns about it, the environment minister has ordered a full environmental assessment of the project—a process that will take years. Nobody is resting easy in the meantime though—least of all the farmers whose own land might be affected. They’ve been working to raise awareness of the quarry, efforts which culminated this past weekend in an epic food-themed fundraiser dubbed Foodstock. When we say “epic,” we mean… epic. Foodstock is hard to capture in a phrase, but basically: imagine a forest studded with about 70 booths, each run by a chef cooking with local produce. The paths are punctuated with musicians and friendly signs pointing out directions. Add a stage at the entrance to the forest with musicians including Cuff the Duke and Sarah Harmer, a PWYC price tag with all proceeds going to the fight against the quarry, and erratic October weather that keeps everyone on alert, and you’ll begin to get a sense of how the day unfolded. It felt like a cross between an old-school hippie jam session and the fancy multi-chef fundraisers we’ve grown used to in Toronto, a genuine blend of grassroots activism and slick organization. We arrived, like just about everybody else, by car, and it’s lucky we got there just as things were getting underway at 11 a.m. By 12:30 p.m., the queues of cars lining the roads nearby extended for kilometres, and some eager eaters were tramping across the fields to make it to the entrance rather than waiting for parking. The event was held in a wooded area on farmland near Melancthon (at Highway 124 and Country Sideroad 20), and once we were parked the first thing that happened was that we got to take a hayride to the forest. If that sounds a little too twee to be good—it wasn’t. In fact, it was quite possibly the best food fundraiser we’ve ever been to, remarkable not just for its scale, inventiveness, and success, but because it represents a real step forward in building a genuine and vibrant conversation between Torontonians and the Ontario agricultural communities which sustain us. Sure, many in the city go to farmers markets and talk knowledgeably about food policy and the Greenbelt, and certainly Ontario farmers know we are a key market for their produce, but it’s not often you get everyone involved—the farmers and food-buyers, the chefs and their suppliers, the activists and the foodies—together to share an experience which makes all their concerns vivid at the same time. For your own journey through the forested adventure that was Foodstock, click on the image above to see our gallery from Sunday.